On Fridays at 365 Less Things I share with you my five favourite comments from my wonderful readers and my five favourite web finds of the week. I hope you will enjoy them as much as I did. I have been consistently having weeks lately where there are so many great comments that it is hard to keep up with them all never mind narrow them down to just five for Friday. I am loving all the great feedback and shared wisdom and I feel sorry for those readers who just don’t have the time to read them all. So here are five that I wouldn’t want you to forget or miss. Not only did Sharron write us a great post last weekend and share photos of her lovely decluttered home but she also left this piece of great advice for Creative Me. Everyone who has clutter at home and especially clutter in a paid storage unit needs to read this comment for Creative me. I know I am focsuing very much on the storage unit issue in my fave five this week but really people need to read this stuff and not all readers read these very important lesson learning comments. So here is another amazing story from Dizzy. I have great respect for Chelle for leaving this comment. She put herself on the line to make a point and set an example of why overindulging our children is not wise. Good for you Chelle and thank you. Fave Five Web Finds. Happy reading! We still have the CDs but they take up a lot less room when not in the cases so these will go to the thrift store for someone who feels the need to have the cases but may have broken a few. My very good friend just became a grandma for the third time today. This is her middle daughters first baby and bub and mum are doing well. Things didn’t go well with her first pregnancy so I am extra grateful that everything turned out well this time. We decluttered one car in March and have not replaced it. My husband has ridden his bike over 900 miles to and from work this year. It’s fantastic! Good for you guys. All we seem to have done is add a motorbike and I still on get the car one day of the working week. Just want to say congrats for your friend becoming a Grandie and power to the new mum & bub, a beautiful happening to be grateful for! I have a question for all if I may, I would love to know if any of your readers have “de-cluttered” so called friends. Does it sound too weird? A lovely lady I know and catch up with now & then was telling me about her de-cluttering binge and along with the usual bits and bobs she threw out of her life 5 so called friends. During the last 7 years I have actually done the same thing! The people I let go of just turned into hard work and quite frankly I just didn’t have the power to deal with their garbage. I hope my friend & I & a few close others are not the only ones to do this! P.S just finished cleaning out comp make-up box and got rid of 45 items of make-up. I can store the box away soon and at least now I can lift it hahahaha! Yes, i have done this, but it was more of an natural decluttering . I think you outgrow certain friends and you should just go with the flow. Any friendship that becomes a chore is probably not working out and you should cut each other loose. My true friends who i probably don’t see as often as i should, we pick up where we last left off and there is no bad feeling about not keeping intouch on a regular basis. Friendships should be easy, natural and truly add value to each others lives. I agree whole heartedly in what you say here. Being as I have moved all over the place during my married life and sometimes end up living close to people I knew from somewhere else or come back to old friends it is lovely to just be able to renew friendships. As you say pick up from where we left off. I think it is almost essential to declutter the odd person from your life every now and again, sometime it may even be a spouse (not my spouse he is a keeper). Some relationships are just toxic and shouldn’t be maintained. Dizzy – great comment!!! I too have several friends that I wish I could declutter but just haven’t been able to – though I have greatly reduced my contact and friendship upkeep with them. They are becoming more casual acquantices than friends. 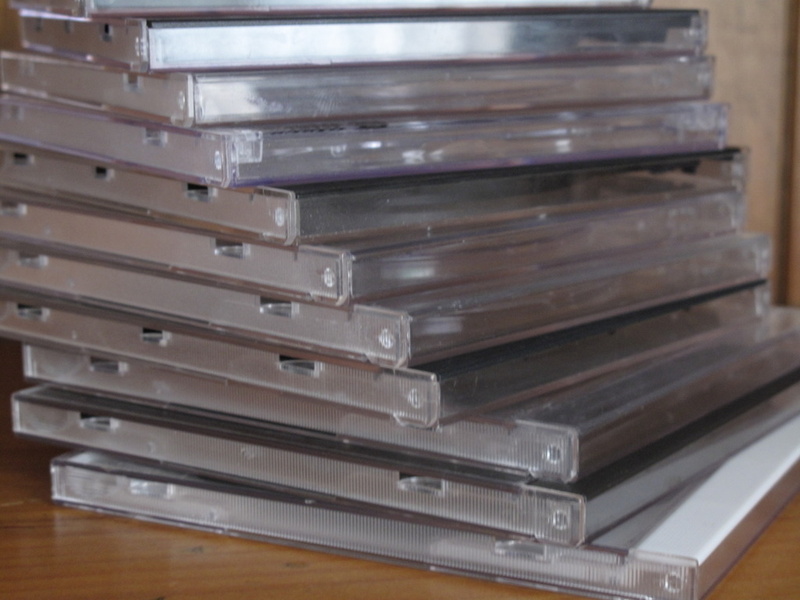 Colleen – tell me how you store your cds???? We have two completely overflowing cabinets and several basekts full of CDS which we could greatly reduce if I could take the steps to get rid of the cases. But I don’t really want to keep them in CD binders. What system do you use?? I need something that keeps the liner notes and the CD itself. HELP!!!! I have included a photo of our CD collection in this weeks Simple Saturday post tomorrow. Three boxes hold the CDs while one box holds all the paper inserts. The plastic sleeves are double sided so hold two CDs. I have de-cluttered friends too and don’t feel guilty about this. If people do not share your core values and/or are solely interested in their own agendas, what is the value of the friendship? Better to invest more time in true friends or in making new ones. Yesterday’s discussion on self-storage really made me think… I don’t have any self-storage and was feeling a bit smug, when it occurred to me that I have one or two “emotional” self storage units that I pay a very high price for – I periodically re-visit these units and pull out my old regrets and anger and sadness and then I pack it straight back in ready for my next visit. So who is the REALLY dumb person here? Yes, me. I am going to clear out those units and close them down and save myself quite a bit of emotional capital. I think we are all guilty of holding a couple of those Emotional Self Storage Units that you speak of. I’ve learnt that sometimes you need those Emotional Self Storage Units for a time while you walk through today’s valley. They mean you can store emotional baggage for later when this problem is dealt with and you then have the emotional space to deal with the baggage. It is healthy to have a good de-cluttering every now and then, just pick your moments. you are probably right but it never pays to ignore those feelings for too long if they are festering and only getting worse. We need to be proactive and seek the strength of wisdom and the will to let go. Absolutely! It needs to be sorted out, just like physical clutter or emotional clutter will cause a whole bunch of new problems. Having watched people come out of stressful periods (divorce, death etc) I’ve noticed that sometimes the best thing we can do for ourselves is allow time and space to heal. I think this is worthy of its own post! Thank you Colleen, again i am deeply honoured to be in your Friday five, there are so many great comments made, glad i contribute in some way!! if is always my please. I would also like to know how you store your CD’s. We just transferred all of the ones hubby listens to onto his iPod, but he doesn’t want me to get rid of any of the CD’s in case something happens. I have an entertainment center filled with CD’s in their cases. Have you addressed this before? the comments from my wonderful readers is what completes every post I publish so the thanks go to you and your fellow readers for making 365 Less Things what it is. As for my CDs I have included a photo in tomorrows Simple Saturday post so check it out. Hi ladies. I’ve been reading your blog every day on the email for a few weeks now and you are inspiring me to clean up, clean out and simplify. One of the serious problem areas for our family was the room our two boys (5 and 8) share. It’s big, but it always seemed to be a mess. So we decided to get rid of all the extra furniture in the room and replaced their beds with ‘captain bunks’ with shelves and cupboards underneath. I also did a serious clear out of their toys. Now they have all their things neatly in the storage under their beds, and I’ve heard them telling each other to ‘tidy up’. Plus there’s a huge clear floor space to play. It’s a much nicer room to go into, and the boys are actually spending more time in there reading and playing. welcome to 365 Less Things and thank so much for dropping by to leave a comment. 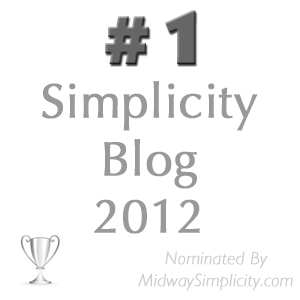 I went over to take a look at your blog and want to now thank you for linking to 365lessthings. I am glad that we have been a inspiration for you to declutter. Your sons’ bedroom looks great and I am sure they will have more success keeping it clean now that it is so well organised. Kids will be kids though so don’t be surprised if the novelty wears of and they return to their old habits. God knows my children don’t have the same tidy gene I have although neither did I when I was young. My mother will attest to that. my faux pas though because as soon as I enter the site I usually go straight to the Archives coz I just love reading about the journey of 365, it is inspirational and take it from someone who has been de-cluttering for a while, I am finding it really handy going back over the blogs & messages that everyone puts in, I just wish it could be face to face and have a cuppa and a laugh with you all, I may have gotten rid of some toxic people but I feel I have found some wonderful blog friends so cheers to everyone with whatever beverage you may have near! I dare say somewhere in the world it is ‘Scotch o’clock’! Or wine, or vodka or schnapps heehee!! P.S just threw out 22 magazines, catalogues & newspapers (they were hiding) in fear no doubt. Yes I do take the time to count things because I think if I took the time to bring them in I can bloody well add them up as they go, the higher the number the more satisfaction I get. I used to do Book keeping so i’m a numbers person hahahaha! Hi, just read this blog for the first time today. The items in the storage units made me wince. I do have an inside storage unit which I originally rented for my used bookselling business. Sadly, I never used it for that – my 20 year old son died and we moved all his things into the unit. It has been five years and we have not been able to deal with his possessions yet. These posts made me think about how much money has been spent all these years and will probably continue being spent. welcome to 365 Less Things and may I extent to you my heartfelt sympathies on the loss of your son. I almost lost my own 19 year old son a year ago tomorrow in a cycling accident and even then I can only imagine what your reality must be like. I can imagine that going through his things would be heart wrenching. Maybe not going through it at all and relinquishing that task to someone else would be a better solution. Ask them to return to you the items that come immediately to mind that you know you would want and let your helper take care of the rest. As you say his stuff isn’t him and it won’t bring him back and your memories of him must be so strong and will never be forgotten. You remind me how lucky I am that my son survived and recovered to be the same your man he used to be. I am grateful for that every day. Thank you for that reminder and once again my heart goes out to you in your grief. Good luck with your declutter journey and I hope one day your chair will just be a chair. what is it with schnaps? (or “Octoberfest by the bay” San Francisco, really?!? )What kind of impression is Germany giving to the world outside?